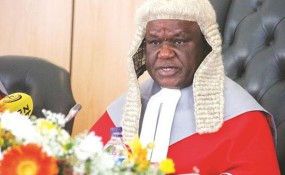 UNITED Nations (UN) agencies and other international organisations operating in Zimbabwe enjoy absolute immunity from every form of legal process and execution instituted in the local courts, including labour suits, Chief Justice Luke Malaba has ruled. Their properties cannot be attached, neither can their bank accounts be garnished over litigation. Chief Justice Malaba, with the concurrence of four other judges of the Supreme Court, last week unanimously quashed a High Court judgment of 2015 that exposed Food and Agriculture Organisation (FAO) to labour suits. The High Court three years ago, issued a garnishee order against FAO to enable the UN agency's former employee Mr Michael Jenrich to recover outstanding benefits amounting to $623 400. FAO is an international organisation responsible for food security and management on behalf of the UN globally and Mr Jenrich was responsible for the local emergency unit. Justice Tendai Uchena, who then was a judge of the High Court, registered the arbitral award and ruled that international organisations, such as FAO, would not escape litigation in labour matters because they only enjoyed "restrictive (as opposed to absolute) immunity that does not apply to cases of a labour nature and does not cover immunity from suit and legal process and execution". However, in a bid to save international organisations, the Ministry of Foreign Affairs appealed the High Court decision at the Supreme Court. Chief Justice Malaba set aside the decision of the High Court and ruled that the principle of restrictive immunity that applies to sovereign States, was not applicable to international organisations. Instead, the Chief Justice said international organisations enjoyed functional immunity. "The ICRC case supra was wrongly decided to the extent that it held that the principle of restrictive immunity is applicable to international organisations," he said. "The decision is overruled. The judgment of the court a quo is wrong because it relied on the ICRC case supra," the Chief Justice ruled. The Supreme Court appeal filed by the Ministry of Home Affairs was allowed with costs. "It is hereby declared that FAO enjoys absolute immunity from every form of legal process and execution in Zimbabwe," said Chief Justice Malaba. "The garnishee order issued on December 31 2014 be and is hereby declared invalid and set aside. "Consequently, the writs of execution issued against FAO's property be and are hereby declared invalid and set aside." Functional immunity enjoyed by international organisations is derived from treaties and conventions they signed with the host country. Government in the appeal, argued that FAO, in terms of the agreements between UN and Zimbabwe, enjoys absolute immunity from every form of legal process and from execution. Advocate Lewis Uriri, instructed by the Attorney-General's Office, represented the Government in the case, while Venturas and Samukange law firm acted for former FAO employee Mr Jenrich. Mr Jenrich, two years ago, obtained a court order to garnish FAO's bank account to recover his outstanding salary of $623 400. He was granted the garnishee order in 2014 by the Labour Court after he successfully took his former employers to court over outstanding salary payments. Mr Jenrich was employed by FAO in 2004 as an emergency programme officer and his fixed term contracts were renewed for six consecutive years. In 2012, FAO did not renew his contract following the abolition of his post, while allegations of misconduct had also been raised against him. Unhappy with the decision, Mr Jenrich followed the labour procedure contesting the termination of contract. Mr Jenrich won his case at the Labour Court before registering the judgment at the High Court.